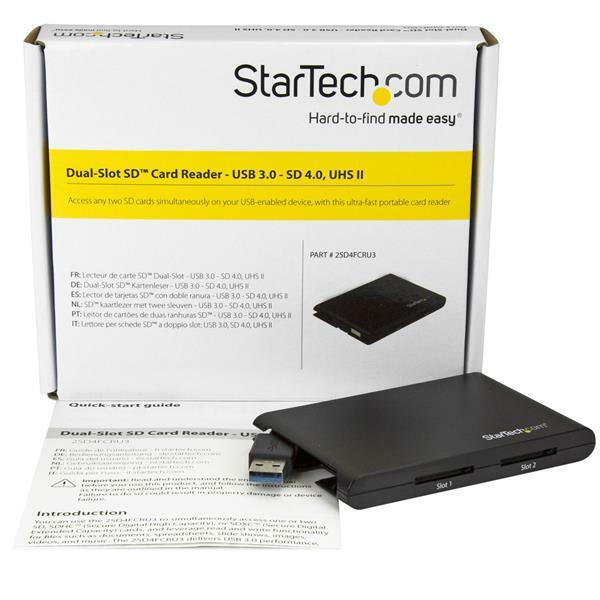 This USB 3.0 SD™ card reader lets you access two SD cards simultaneously. The card reader transfers files between your USB-A tablet, laptop or desktop computer and the SD card. The USB SD card reader features SD 4.0 and UHS-II support. It reads and writes to and from the cards at speeds of up to 312MB/s. The reader also supports USB 3.0 connection speeds of up to 5Gbps between the computer and the reader. For 70% faster performance between the computer and the reader, UASP is also supported when connected to a computer that also supports UASP. The reader is backward compatible with USB 2.0 and 1.1. 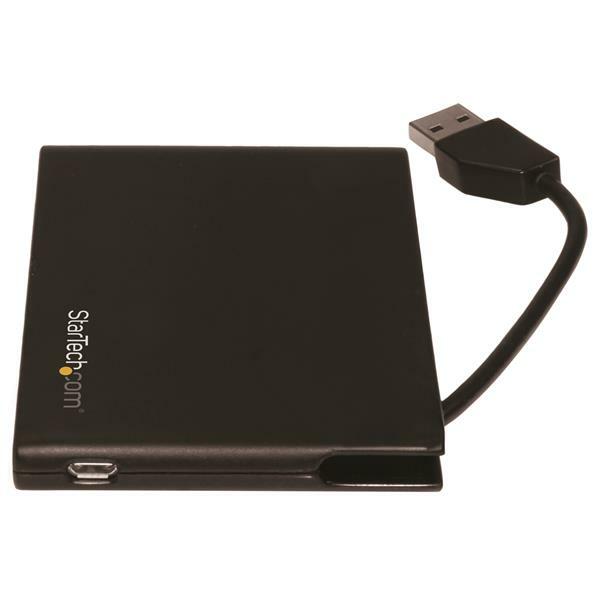 The dual SD card reader supports all SD cards: SD (Secure Digital), SDHC™ (Secure Digital High Capacity) and SDXC™ (Secure Digital Extended Capacity). It also supports UHS cards, and is backward compatible with older SD cards. The reader has a small footprint design and comes with a wrap-around USB-A cable. It fits nicely inside a carrying case. The reader is USB powered, but you can connect a power source to the Micro-USB power port if you require more power. 2SD4FCRU3 is TAA compliant and comes with a StarTech.com 2-year warranty and free lifetime technical support. Note USB powered. For additional power, connect the USB cable on your power source to the AUX Micro-B power port. Fast. This adapter was able to transfer much faster than other adapters I've used. I have a lot of vacation photos on many different SD cards and this adapter made it extremely easy to transfer them all to my computer. While one was transferring, I was able to remove and insert another in the other slot. The plastic enclosure is solid and well made. If I had one gripe, it would be that the USB cable is very short. Best used for Laptops I'm thinking. I received this product in exchange for an unbiased review. I use this product to copy 2 SD cards to a computer at once or to copy the contents of one SD card to the other directly. 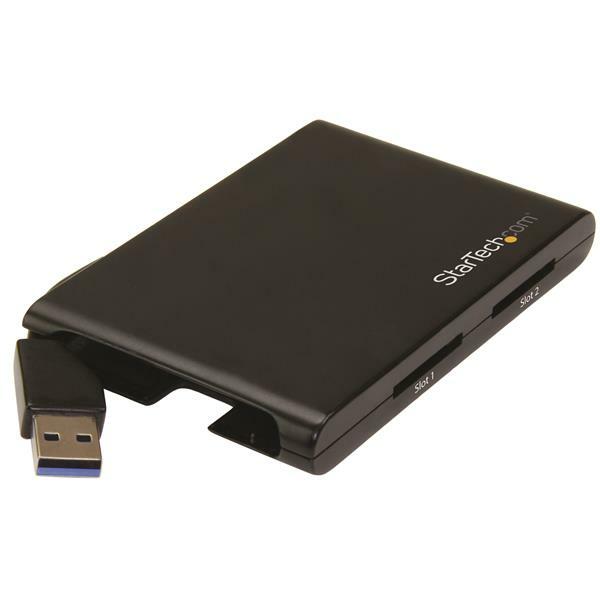 The speeds are fast and the enclosure is small and lightweight and easy to carry around in a laptop bag. The enclosure feels solid and the cable tucks into itself. Great little product and works as intended. I received this product in exchange for an unbiased review. (5 stars) Perfect for Photographers! I used this for imaging and it worked great. Data transfer was fast. The plastic enclosure seems tough enough. I have used this dual-slot SD card reader with different computers and SD cards for a few weeks now. The card reader comes in a small box about the size of one third of my keyboard. The card reader itself is very small, about the size of a credit card but only slightly thicker than a USB port. The reader is made of plastic, very light and almost feels empty. The USB cable on the reader is only 2 inches long and wraps around to store within itself. I wish the cable was longer so I could sit the reader on top of my tower computer rather than have it just hang there in the air. This reader makes copying SD cards between each other very quick and easy. I can also quickly copy data from many cards by getting multiple going at the same time and swapping the completed ones. Very fast operation and easy to use with a variety of cards, I will keep using this device for all my SD card needs. I received this product in exchange for an unbiased review. (5 stars) Excellent Product - Well worth the purchase!! Note: I received this product in exchange for an unbiased review. This product arrived quickly after selecting it for a review. It is well made, light and easy to carry in your pocket or bag (aka with SD cards inserted). I selected this product to write a review primarily based on my needs (data storage on micro or sd cards). I have alot of cell phones, computers and other devices that make use of micro or SD technologies. It was fast becoming a pain to copy, delete or backup each of these cards or for that matter even keep track of what is on them. This product will not help with the tracking but it does help with the copying, deleting and backing up of data on these cards. Pretty much ever device these days uses these cards, cameras, security camers, cell phones, computers. These cards have become convenient and useful and keep getting bigger in capacity every day; which is why this dual slot device has been very handy. I am a MAC user first and foremost but secondly I am a Windows user and a Linux user. I ten to use whatever compute device is handy at any giving time. We all know that if your device can accept a micro or other size SD, you usually only have one and most device can be constrained by available USB or USB-C ports. I use a tool on the MAC called SDCLONE, which makes copies of SD cards and now it is even easier (no swaping of cards) as I can make copies and do backups of each of SD cards all in one convenient device. Granted this device works on all computers (mac, windows, linux) but does not copy with software but finder or explorer work just fine too. I like the extras available in other file managment tools. The device is a valid USB device so there should be no issues with connecting it to any computer you own. No worries. I did not find any SD adapters that did not work. We all know that the little read/write switch on some of these adapters can be somewhat tedious so make sure the switch is set properly. However this does allow a security feature in that, with the proper switch setting, you can go from read only to read/write. Depends on what you keep on the cards (pictures, music, other data). SD cards are great for sharing but are slower than normal storage. USB 3 is fast and allow for quick copies even of full cards; much better the USB 2.0 or USB 1.1. Please remember the SD cards will be slower than a internal physical drive - nature fo the beast. Some MACS and WINDOWS computers also may have SD card readers so you are getting more SD capabilities with the addition of the Dual Slot SD Card Reader. So far the only anomoly that I have found is that 1 Windows 10 Pro computer refused to read or recognize the cards inserted in the devices but this could be a problem with the computer and not the device. Other Windows 10 Pro devices read them ok as well as MAC and Linux (with appropriate drivers if necessary). It could also have been a card issue - some SD cards will be fine on some computers but then can be unrecognizable on others - might be firmware issue but certainly not the fault of this device. I am extremely pleased with this device and it has exceeded my expectations and usage parameters. Well done!! This has become a tool in my computer carry bag for sure. It is highly recommended to purchase if your usage needs are similar to mine. If you have need of a USB-C device, there is one available as well. Thanks again to StarTech for allowing me to review this product. I have been in the technology business for over 35 years and for the past 20+ years I have been asked to provide unbiased reviews of various products from both the AV and IT world. 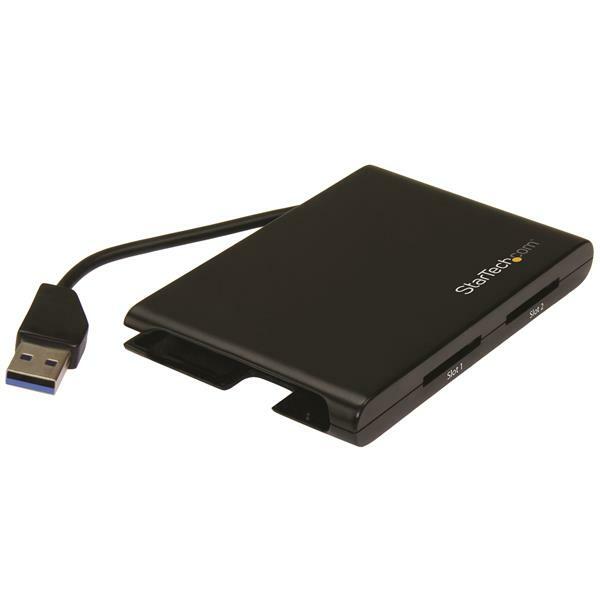 In review of this product I have found that it supports all popular SD cards such as SDSC, SDHC and SDXC including UHS cards, and is backwards compatible with older SD card versions. By providing two separate slots and support for a wide range of SD cards, the dual card reader helps to overcome the challenges of working with multiple card readers to offload your files. 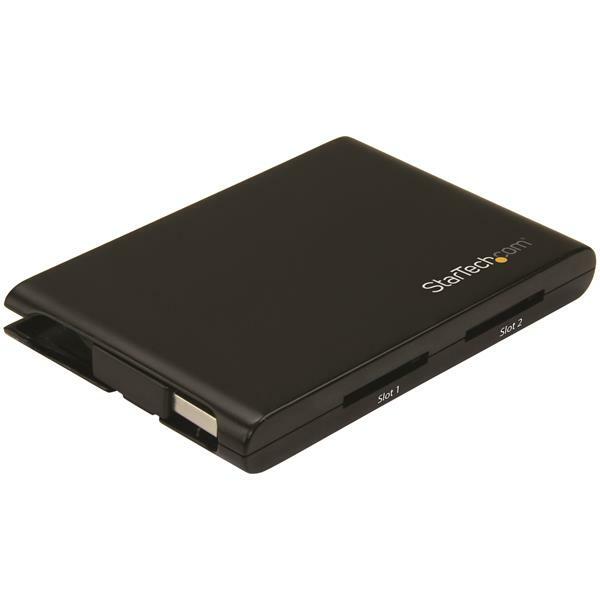 In the box: -Dual Slot SD Card Reader -Quick Start Guide In summation, solid product, easy to use. I received this product in exchange for an unbiased review.